What a treat we just enjoyed! I’m sure those in Texas and cowboy-land have heard of this, but I had not; so I decided to give it a try. We now have a new favorite Tex-Mex snack! Mix all ingredients together. Let sit for at least 1/2 hour (best if refrigerated overnight to let flavors blend). 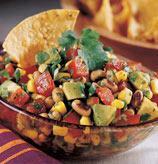 Serve at room temperature with tortilla chips or Fritos. 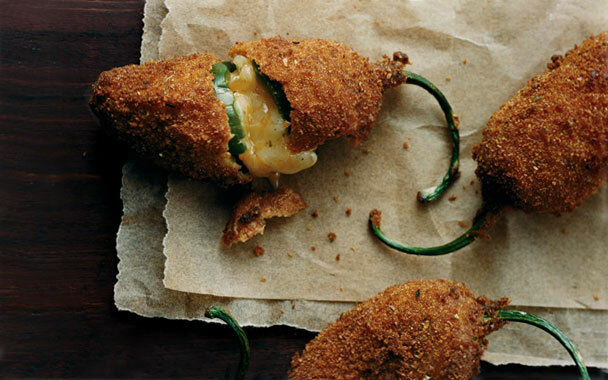 Jalapeno Poppers – Love at First Bite! Mix together the cheese and Tabasco sauce. Fill the opening in each pepper with cheese mixture and press shut. 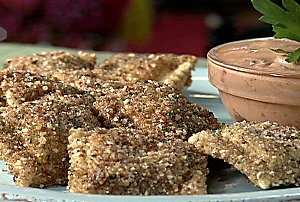 Mix together breadcrumbs, oregano, garlic powder, salt and pepper. Beat eggs til well blended. Heat the oil to 320-330 degrees. Dip the stuffed chilies into the egg, then dip in the breadcrumb mixture. Repeat to coat each pepper twice. Place in the hot oil. Brown on all sides – about 5 minutes. Drain on paper towels. Cool slightly. I served it with apricot jam mixed with jalapeno pepper jelly. A spicy hot/sweet treat!